Recorded by ; Bruce Bouillet and Tom Fletcher. Additional recording by Billy Sherwood, Michael Scott and Jim Mitchell. Mixed by Tom Fletcher and Bob Kulick (except track 14; mixed by Bruce Bouillet & Bob Kulick). 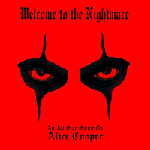 This release is actually a re-issue of "HUMANARY STEW - A Tribute To Alice Cooper (1999)", with the tracklist in a different other, and three bonus tracks added.